Heading for the same destination. Two roads to Santiago de Compostela, near Caldas de Reis, Galicia. In the distant past, most pilgrims walked the Camino as an act of religious devotion, ritual penance or thanksgiving. Perhaps they were searching for remission of sins or paying off a moral debt. Maybe some believed that the travails of the walk tempered their souls in preparation for the rewards of a vividly imagined afterlife. Perhaps pilgrimage was a seasonal thing, something you did because winter had melted away and the restlessness of spring was tingling in your feet. Today these rationales still propel some pilgrims. As Emmy and I walked the Via Portugues, we bobbed for a time in the wash from a group of earnest Spanish pilgrims. There were about a dozen of them: elderly women rolling along in black dresses and black stockings with snow-white Nike shoes; chattery, lip-sticked housewives; cheerful men with waistlines as lumpy as their backpacks; and several children making occasional watchful attempts at naughtiness. (One of the children was an African boy about 10 years old – probably a newly arrived orphan refugee – who couldn’t speak much Spanish and whose big eyes seemed filled with loneliness and bewilderment.) The party managed to combine solemnity with ebullience. They carried aloft a small cross on the end of a pole, and as they progressed they recited Hail Marys, sang hymns, thumbed their rosary beads, and knelt in roadside prayer. But they were exceptions. In one way or another most of the pilgrims we met seemed to be… what is the right word… escapees? They kept their religious motivations (if they had any) to themselves but many walked with a kind of single-minded intensity, grunting and puffing with the clenched determination of marathon runners. Pre-Camino, they had probably been living a life that was regimented, stressed, noisy, cramped, fraught, compromised. They were hounded by a reality that grabbed them and bullied them, constricted their chests and glared relentlessly into their faces. On the Camino they were eager for an experience that would lift this weight of the everyday from them. To that extent they were “religious”. There is a kind of excited innocence, and sometimes a scarcely concealed yearning, in these observations. They communicate a vision of the Camino as a back-to-basics path of pre-modern simplicity, a bucolic idyll speckled with antique buildings and beaming companions. Certainly this image is right up front in John Brierly’s canonical guides to the Camino pilgrimage routes – little books that almost all English-speaking pilgrims seem to carry (certainly we did). For example, Brierly greets woodland paths and country roads lyrically and contrasts them with the harshness and danger of asphalt highways. 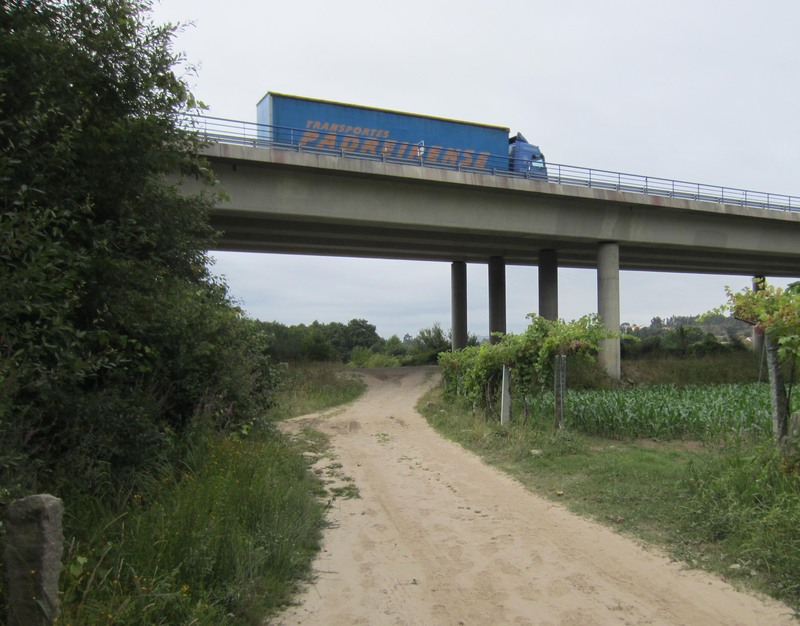 A truck passes over the Camino path. It is probably carrying the necessities of life that pilgrims must consume in order to keep walking. 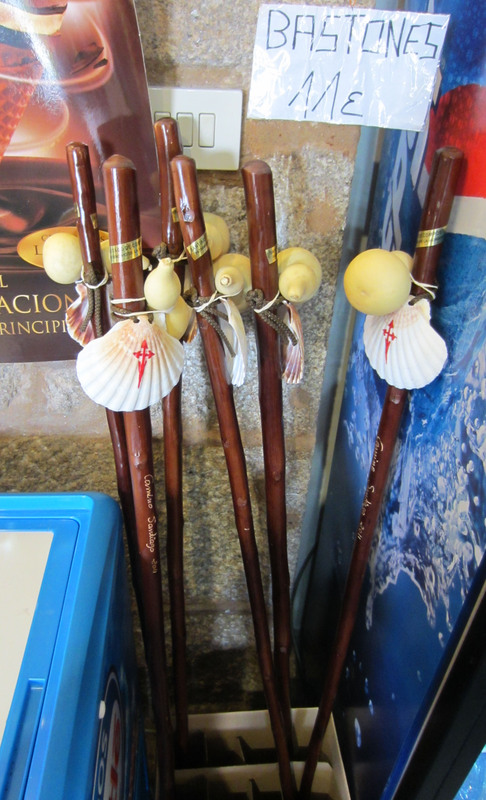 Souvenir staves, shells and water gourds… just 11 euros per set in a souvenir shop in Tuy on the Spain-Portugal border. 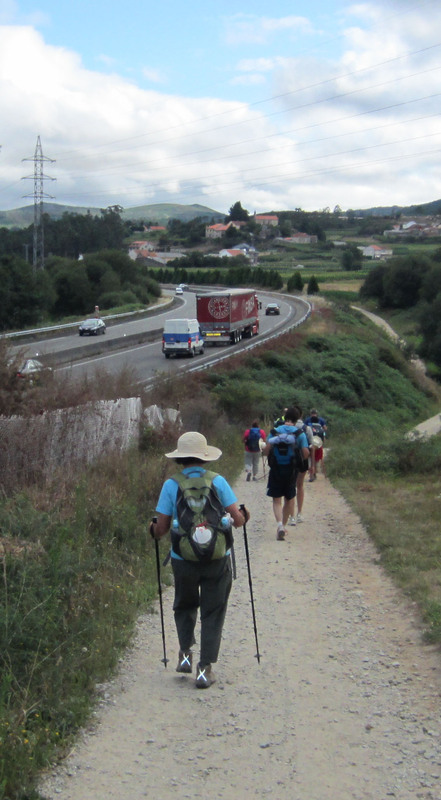 The fact is, the Camino cannot be disentangled from the lifestyle it is supposed to reproach. Its romanticised “otherness” is a delusion. The despised asphalt highway carries the food that pilgrims eat, the materials that build albergues and hotels, the buses that whisk staff to the airports that pilgrims use, the vans that run sherpa services for pilgrims, the trucks that deliver souvenirs to the shops of Santiago de Compostela. To be blunt, it is this “degraded” world of modern commerce that makes mass pilgrimage possible. There is no return to a medieval past, there is no genuine stripped-down simplicity, except in the imagination of pilgrims determined to shut out reality and romanticise their walk. Today the Camino pilgrimage is in a symbiotic embrace with the economy of northern Spain. The two infuse each other and give momentum to each other. They are Siamese twins with a single heart. 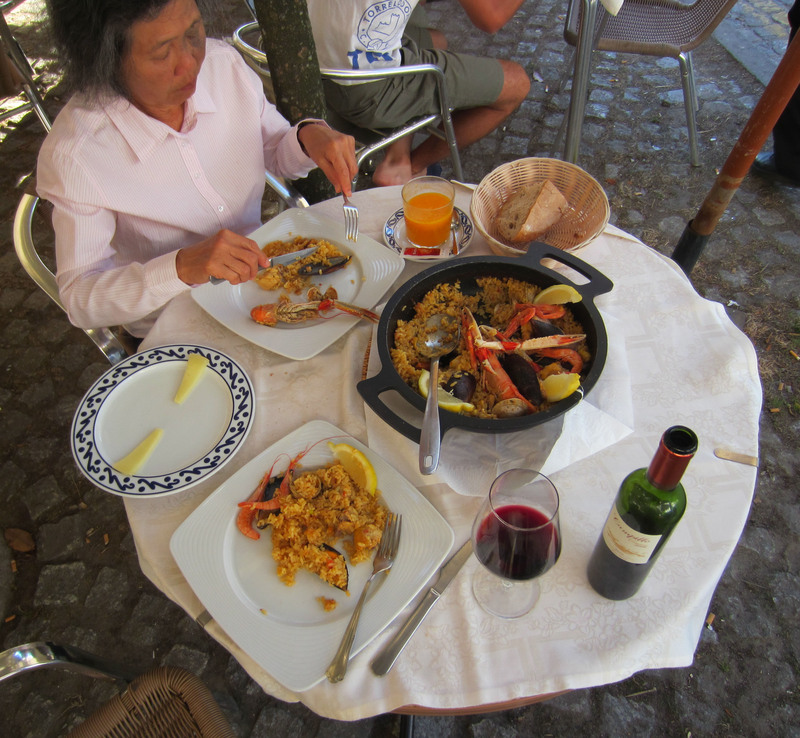 Hungry pilgrims who like to eat well (like Emmy and me, for example) keep countless local restaurants alive. In Carlisle, northern England, we celebrated our completion of the Cumbria Way walk (see Footsore in Carlisle: We complete the Cumbria Way posted August 22, 2011) with a meal at Nando’s in Warwick Street, one of a world-wide chain of restaurants that specialise in fried chicken spiced with Portuguese peri-peri sauce. A Camino story was emblazoned in wavy lines of lettering on the wall behind us. … and – we should add – it is also the symbol of Nando’s peri-peri fried chicken. 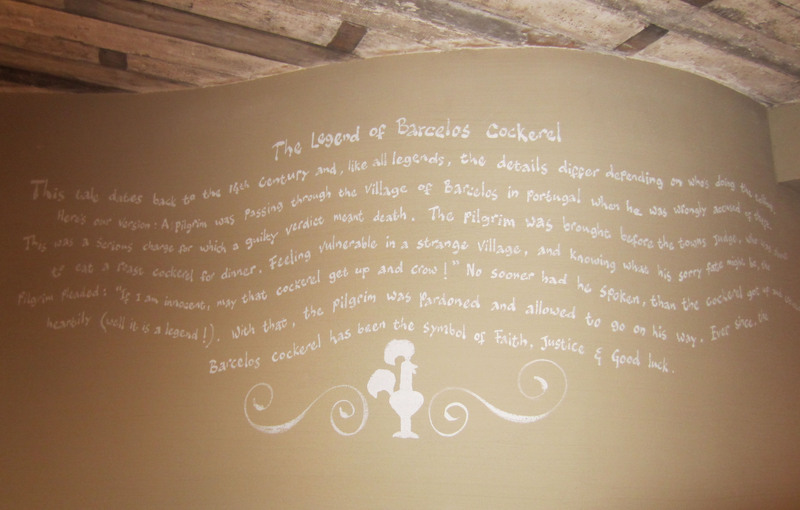 A story from the Camino pilgrimage on the wall of Nando’s peri-peri chicken restaurant in Carlisle, northern England. Thus does the power of a Camino narrative lend pseudo-religious authority to Nando’s corporate image, helping the company to filch money from the pockets of diners and boost profits even in the bleak streets of distant Carlisle. 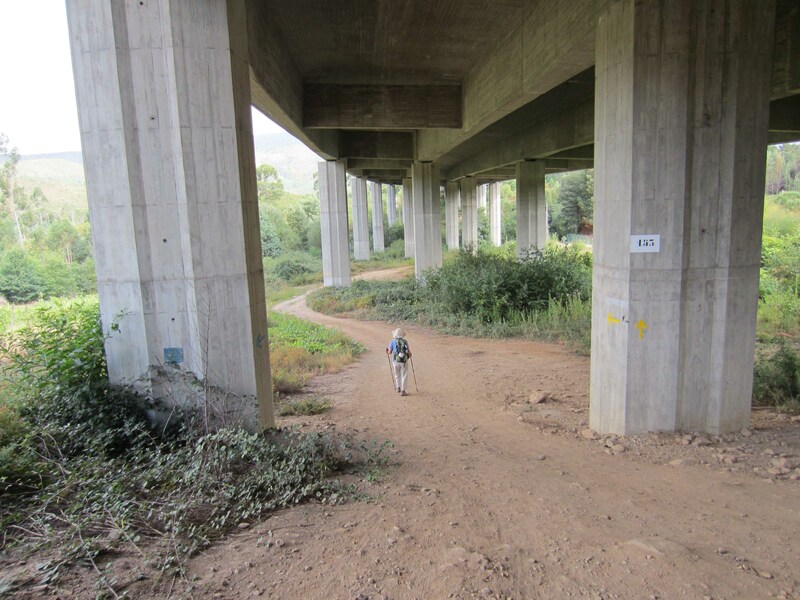 … but the Camino depends absolutely on those highways, i.e. on the infrastructure of modern commerce, and can’t be disentangled from it. 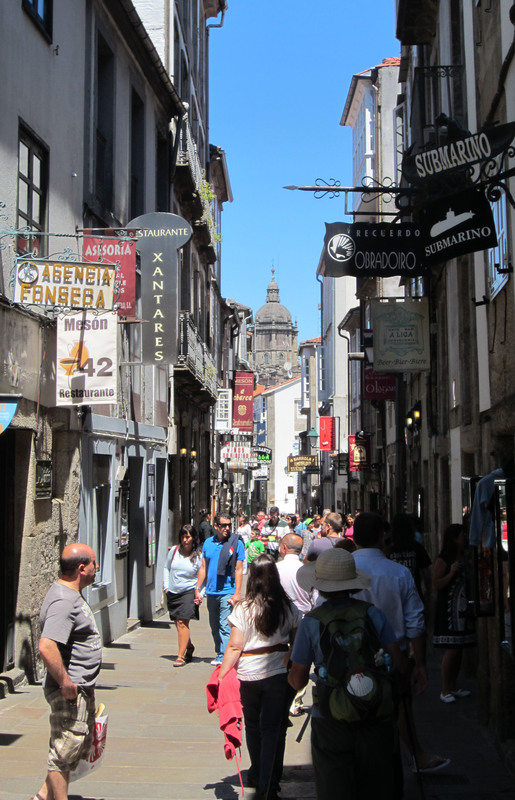 In Santiago de Compostela the earthen path and the asphalt highway merge in the city’s narrow lanes – packed with restaurants and souvenir shops – that lead to the cathedral. 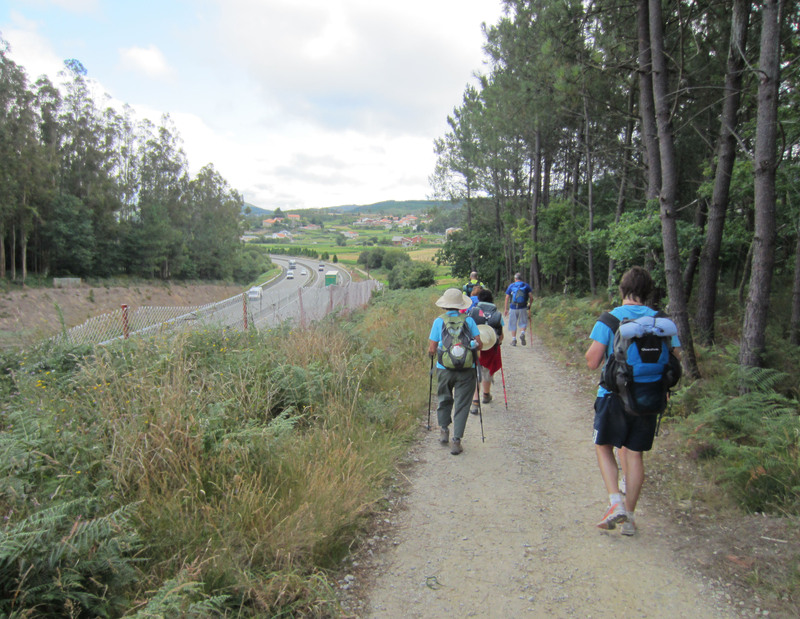 This entry was posted in Camino de Santiago by George Quinn. Bookmark the permalink. A correction: Jane Christmas is a Canadian (not an American). Canadians get more ticked by the error than Americans do when they are pegged as Canadians. (It’s like the Australian/New Zealand thing.) If you read further into Christmas’s book, she has a look at this phenomenon. Thanks Peter. I’m a New Zealander myself (AND of Canadian descent – my father was born and grew up in Nanaimo on Vancouver Island) so I understand your comment. When I can get around to it I’ll correct the error in the post.